It's quite a leap from cozy mysteries one day to Leighton Gage's latest Chief Inspector Mario Silva police procedural the next. 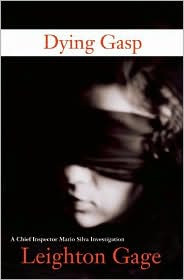 Dying Gasp is no cozy mystery, with its investigation of snuff films, child prostitution, and kidnapping in Brazil. But, it is an outstanding, powerful story; a mystery that will be hard to forget. Leighton Gage's Chief Inspector Mario Silva is a member of the federal police because they have jurisdiction throughout Brazil, and it allows him to travel to investigate unusual cases. Of course, as a federal officer, he's subject to the whims and political pressures of his supervisor, and politicians. And, Silva isn't a popular person, blamed for the escape of a criminal. So, when a high-ranking official wants someone to look for Marta, his runaway granddaughter, Silva is an easy choice, even though runaways don't fall under federal jurisdiction. Silva and his team track Marta to Manaus, a hellhole on the Amazon. One case intersects with another, an enquiry Silva's nephew, Hector, brought back from Amsterdam. A bombing there led to an accidental discovery of snuff films, and the police suspect they can be traced back to Brazil. How can one little town in Brazil harbor so many criminals and corruption? Silva and his small group of trusted supporters must find a way to uncover the dirt and corruption that impedes their case. The muck is much deeper than everyone suspects, even the cynical Silva. Leighton Gage's Chief Inspector Mario Silva Investigations are powerful books that expose the dark underside of Brazilian politics and life. They're gritty, fascinating examinations of a world we don't want to acknowledge. Dying Gasp, the third in the series, is the strongest, best one yet. Leighton Gage's website is www.leightongage.com, and he blogs as part of the team at murderiseverywhere.blogspot.com. Leighton also just announced that readers with a Kindle can get a free download of Blood of the Wicked, his first book, when you buy a download of the latest, Dying Gasp, at the normal price. The deal goes until February 5th. Dying Gasp by Leighton Gage. Soho Press, ©2010. ISBN 9781569476130 (hardcover), 274p. FTC Full Disclosure: The publisher, Soho Press, sent me a review copy, in hopes I would review it. It's worse than child endangerment, Elizabeth. It is very good, but I don't know that it's going to be what you expect. It's very gritty, and it might be more than you care to read. Doesn't sound like my cuppa' but thank you for the heads up. I've got the first two books in this series here at home and have been intending to read them for some time. I think I'll move #1 up the list and get to it soon. I know these are gritty, but I enjoy gritty at times. Just not all the time. Brazil is fascinating to me as we've had several friends who have lived there as missionaries. My parents visited Manaus more than once and we still have good friends who live in Recife. Today, I'm blogging on why Brazilians speak Portuguese. Elizabeth and Kaye: Lesa is quite right (as she invariably is) but there are quite a few redeeming characteristics. Just gloss over the gritty. I do it myself with a few other authors - mostly the ones that are even grittier than I am. I forgot to copy and paste. You're welcome, Kaye. These are terrific police procedurals, with that black humor police are famous for. In fact, I love the final chapter. But, they are grim. Now, I think you'll enjoy the books. I like the black humor, and I love Mario Silva and his team. And, this book wrapped up a complication from the previous book, so don't skip book #2! These books are getting better all the time! Thanks for stopping by. Terrific story, and I do love the last chapter, and the humor there. yes, quite a change from a cozy...but I like to change up a bit, even if I am still reading in the mystery/thriller genre. It is a terrific book, Caite. It's just that after chatting about cozies, I wanted to make sure readers knew this was a mystery with a much darker story. In general, I'll read anything that Soho Crime puts out - so between the publisher's rep and your good words, I'll take a chance on this one. Thanks, Lesa! You're welcome, Clea. I really do recommend that you read the earlier ones first, though. And, if you can't, you should at least read #2 before Dying Gasp. I've heard that Soho Press is a great independent publisher for mystery writers. Sounds like that on is a good read. Soho Press is a great independent publisher for mystery writers; you're right. And, I highlight one of their books today as well, Random Violence by Jassy Mackenzie.